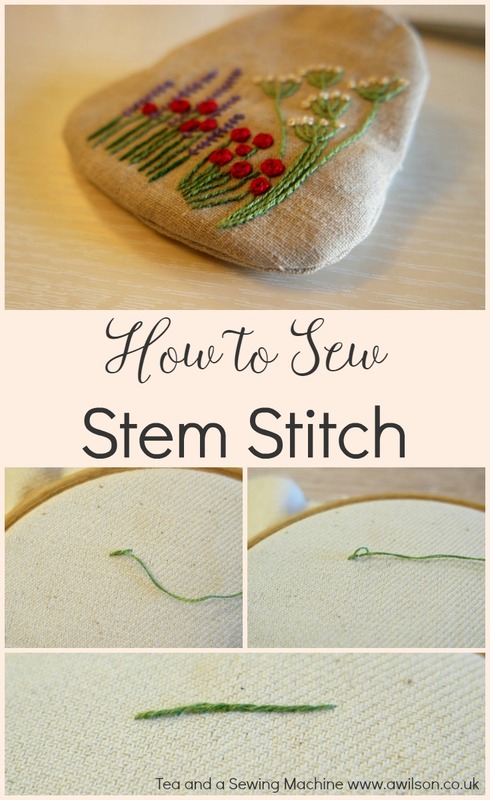 Stem stitch is a useful embroidery stitch to know if you need to embroider lines as part of your design. Obviously it’s great for stems, but it can be used in other ways to! It offers an alternative to back stitch and running stitch, and is a slimmer option than chain stitch, which can look a bit chunky. I’ve used stem stitch for the stems of the flowers on this piece of embroidery I’ve been working on, and I’m very happy with the results! 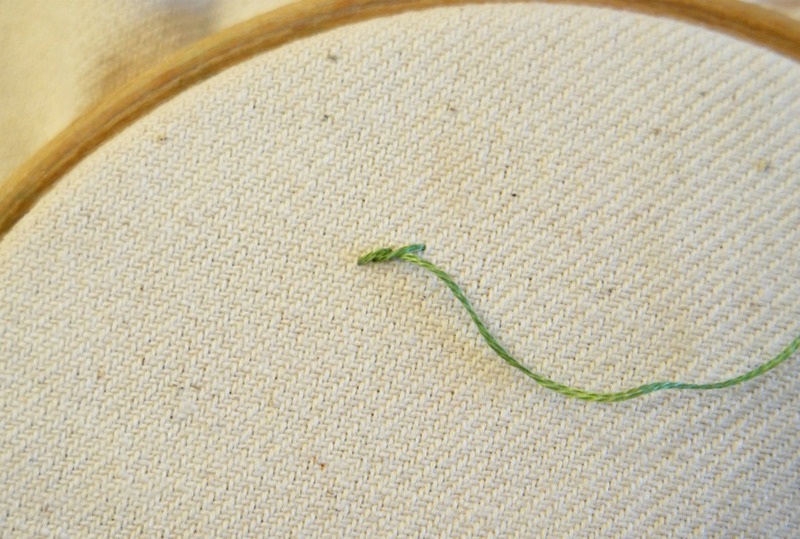 For the fabric, I used a cotton linen blend, and to embroider the flowers I used 2 strands of DMC embroidery thread (affiliate link). 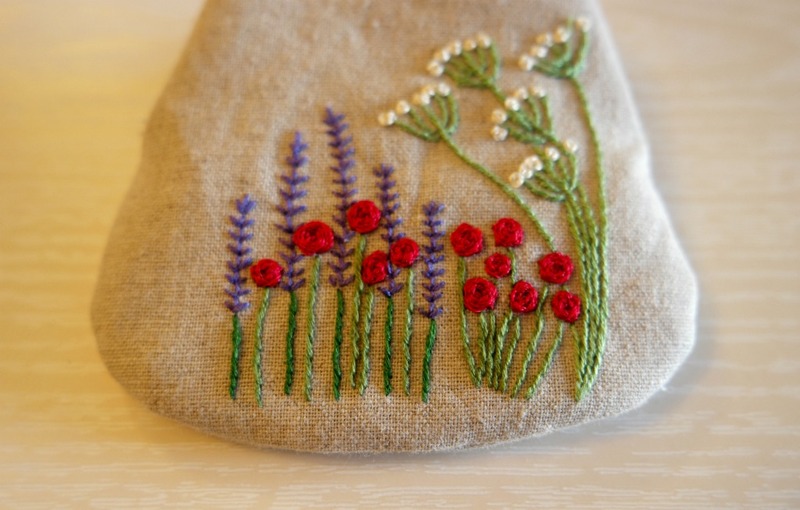 If you would like to practise your embroidery stitches on a free design, you can download the one for these flowers, plus the daisy design I used in this pouch tutorial. 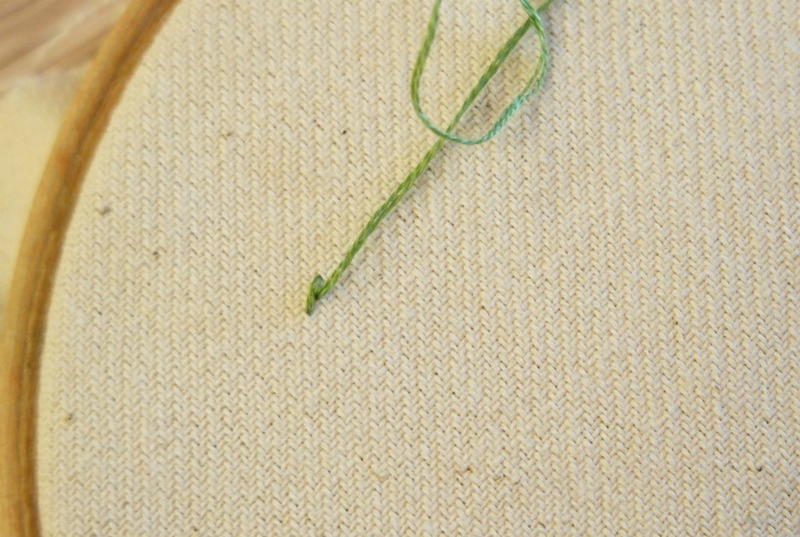 Stem stitch is worked along a line and from left to right. 1. 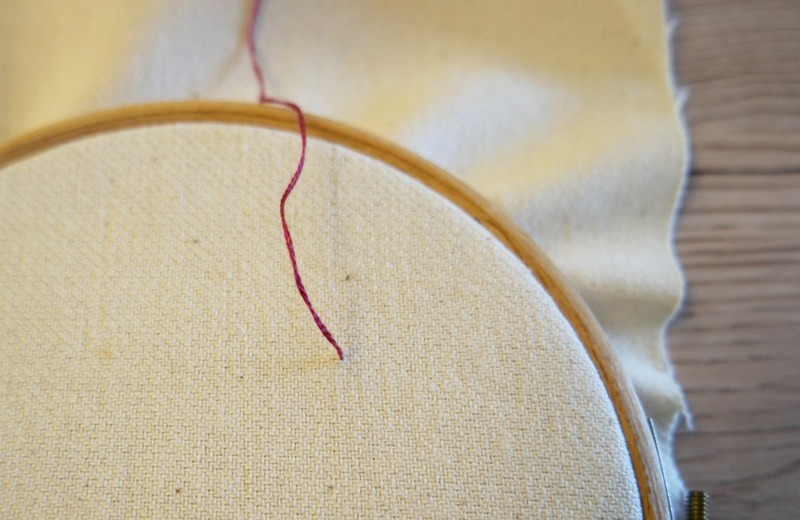 Bring the thread up to the right side of the fabric, where your line starts. 2. 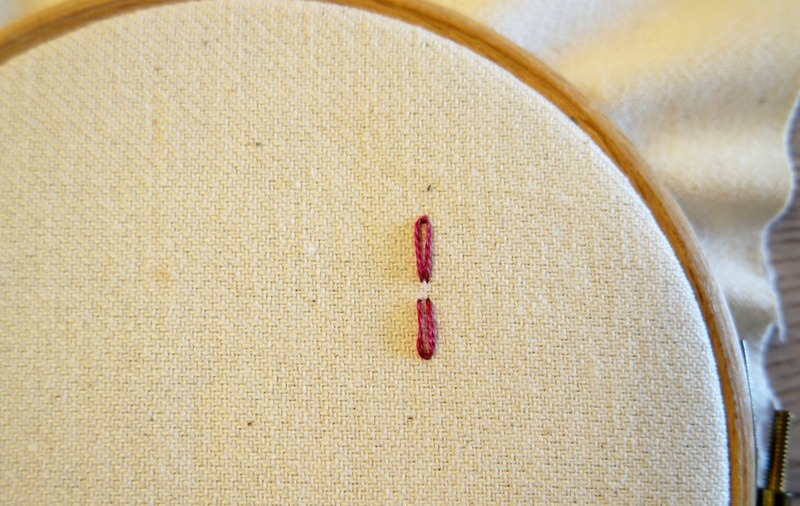 Sew a horizontal stitch, but before you pull it taut, bring the needle up half way along the stitch. 3. 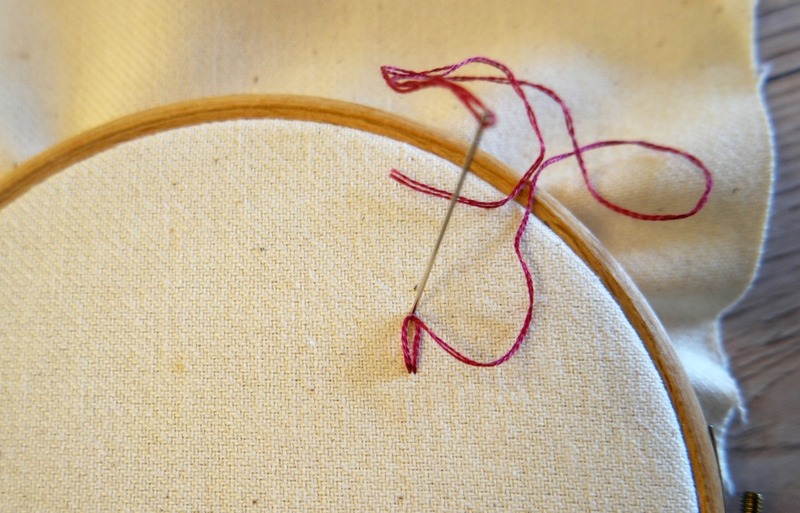 Pull the thread so that the stitch lies flat on the fabric and the thread is underneath the stitch. 4. 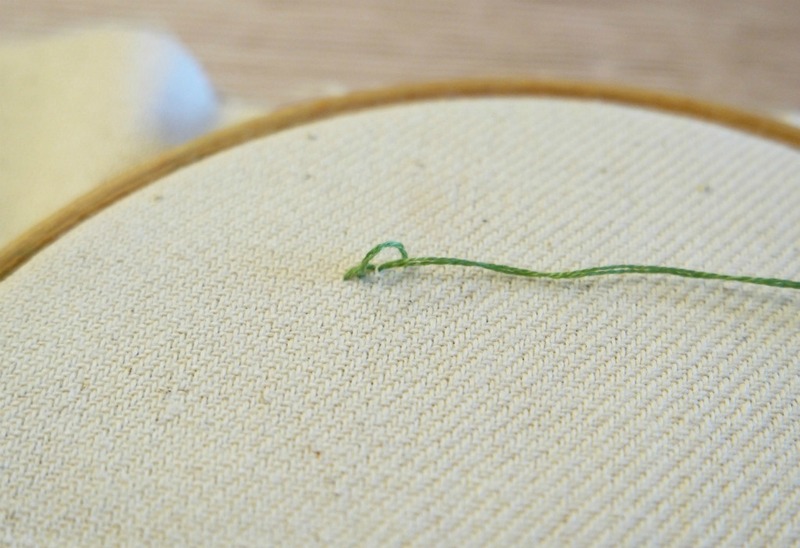 Make another stitch. 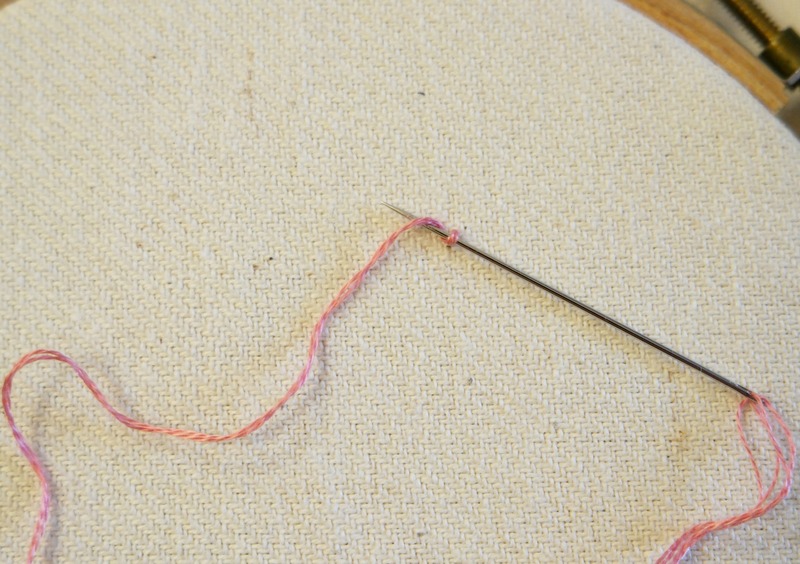 This time, before pulling it taut, bring the needle back up to the end of the previous stitch. 5. 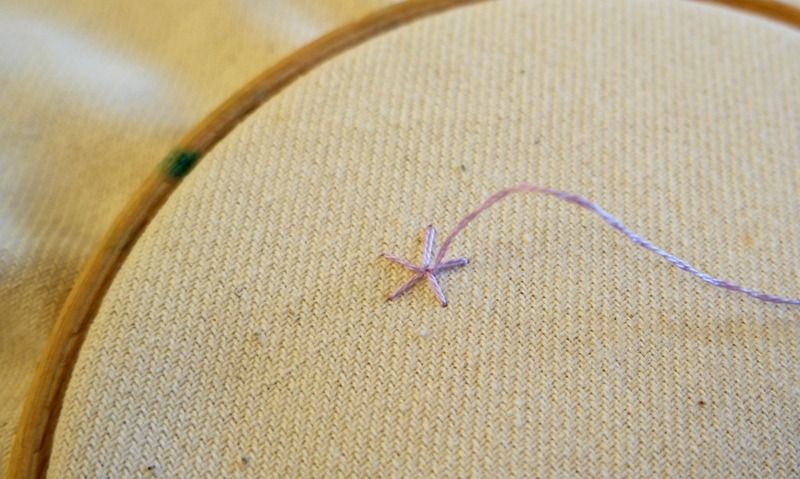 Then pull on the thread to make the stitch, checking that the thread is underneath the stitch. 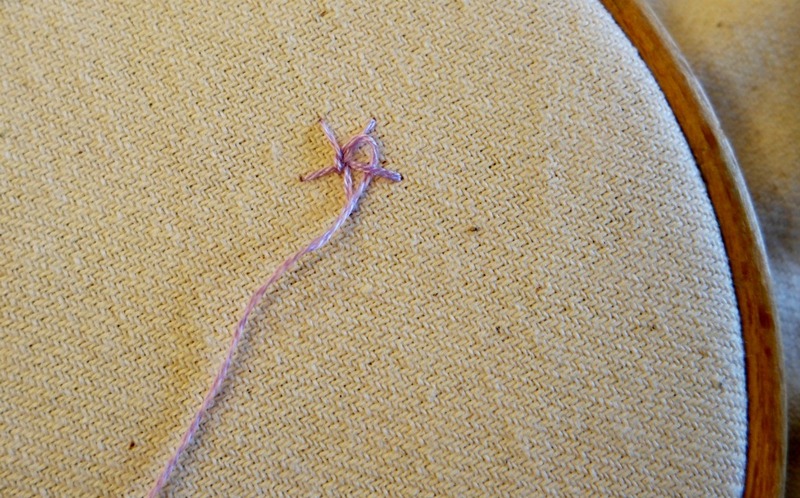 Keep going in this way, making a stitch, then making the next one half way along. 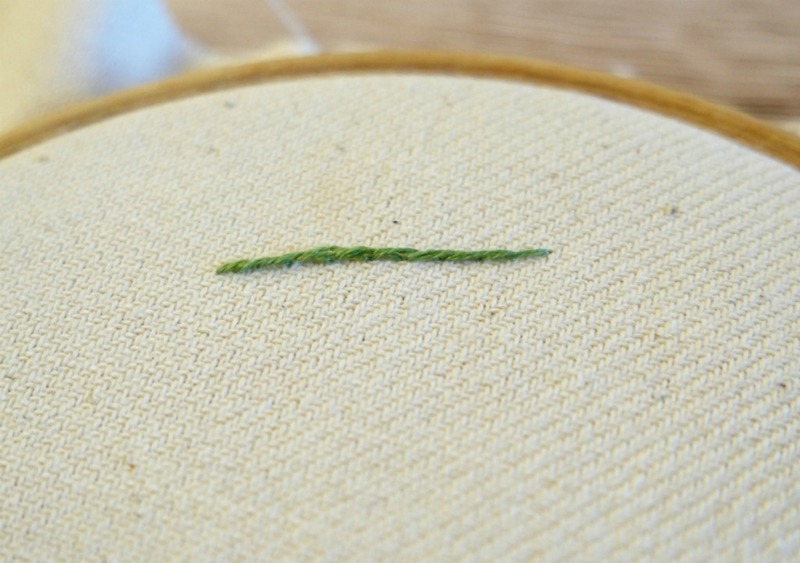 Work in a line until your line of stitches is long enough. 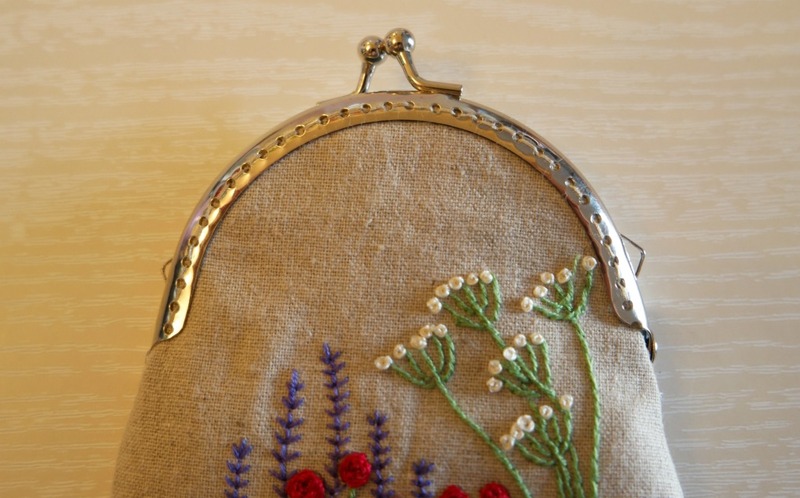 And if you want a project that uses embroidery, you might like to take a look at this tutorial that shows how to make a pouch with a zip down the centre, and embroidered daisies on either side of the zip. 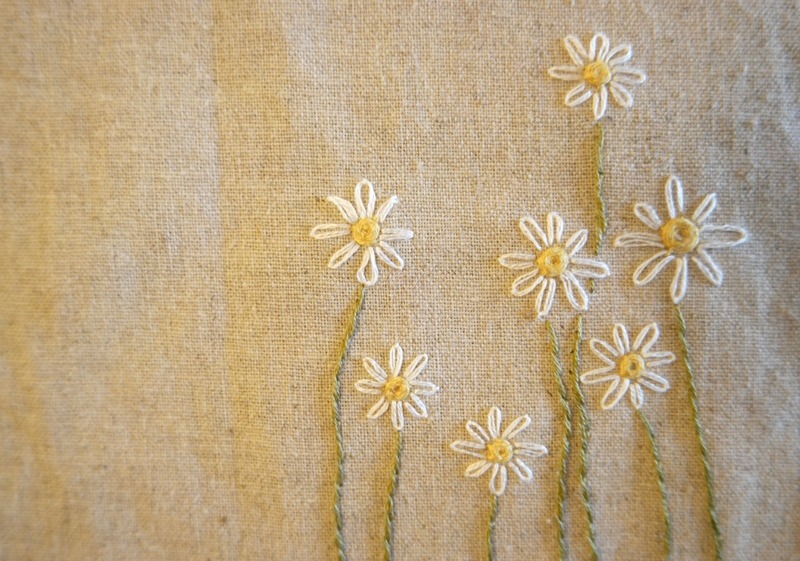 The daisies use stem stitch, lazy daisy stitch and woven wheel stitch. 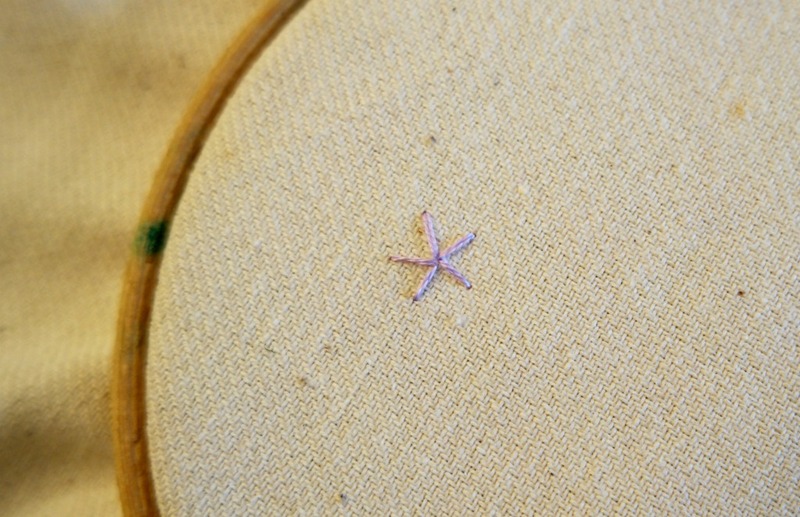 One of the lovely things about embroidering by hand is that you can get all sorts of different textures that you just can’t if you use the sewing machine. 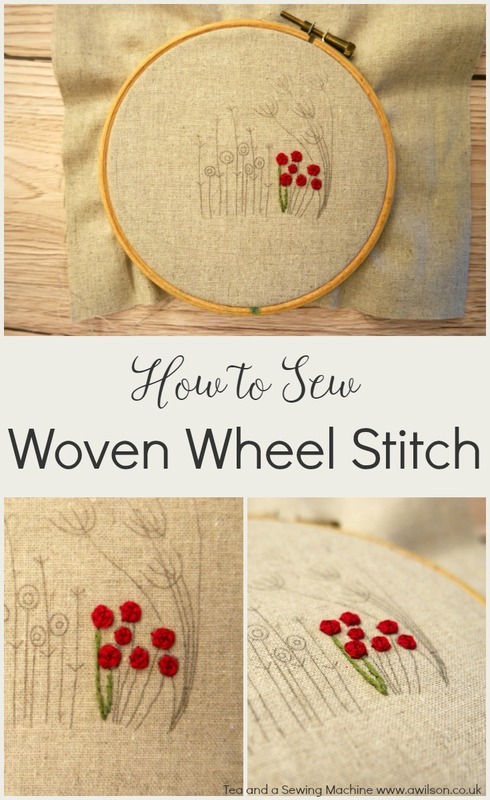 Woven wheel stitch is a raised stitch and it adds a little bit of a 3D effect to your embroidery. 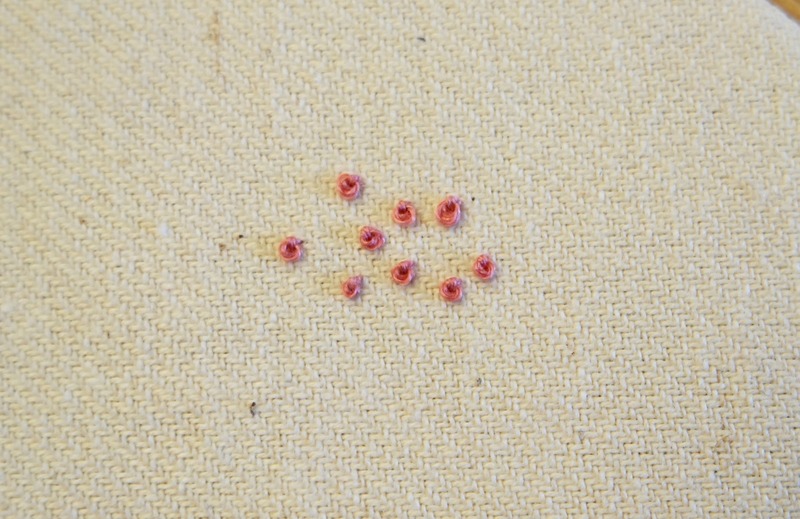 Kind of like French knots, except that they are bigger. You can make them as big or as small as you like, depending on what you need! They are useful for making flower centres (I used them for the centre of these daisies), or you can use them as flowers on their own. 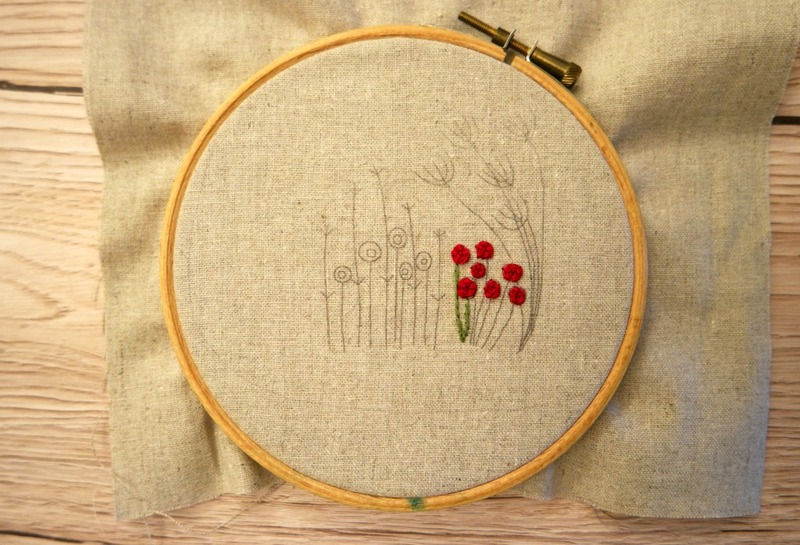 I’ve used woven wheel stitch for the poppies on this piece of embroidery that I’m currently working on! They can also be used as eyes, buttons, in fact anything where you might want a little raised circle! It’s easy and it’s fun to do, although it does take a bit more time than some of the other stitches. 1. Decide roughly how big you would like the wheel to be. You could draw a circle using a template, or just mark it with a pencil. 2. 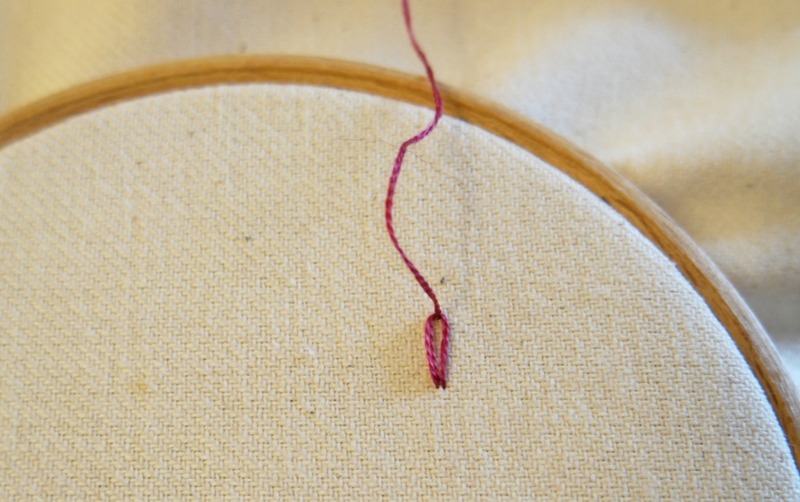 Bring the thread up from back to front into the centre of where you want the stitch to be. 3. 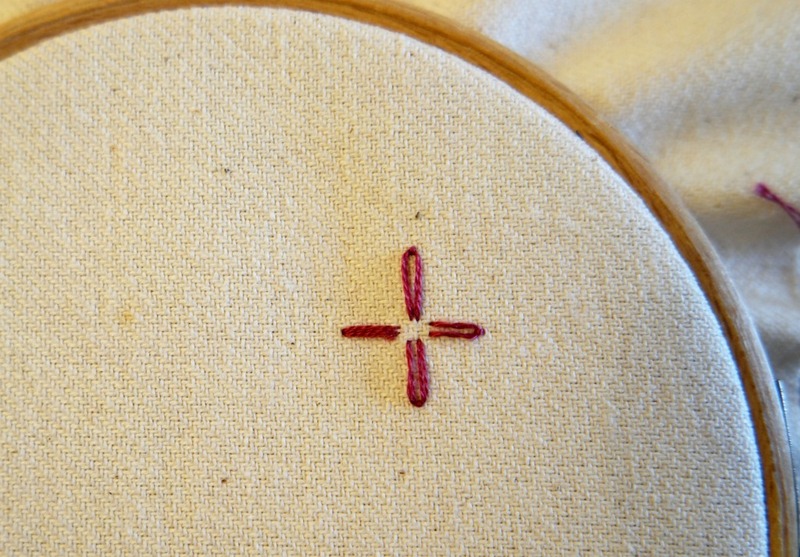 From the centre, sew 5 stitches going outwards, roughly equal distance apart. 4. Now for the weaving! 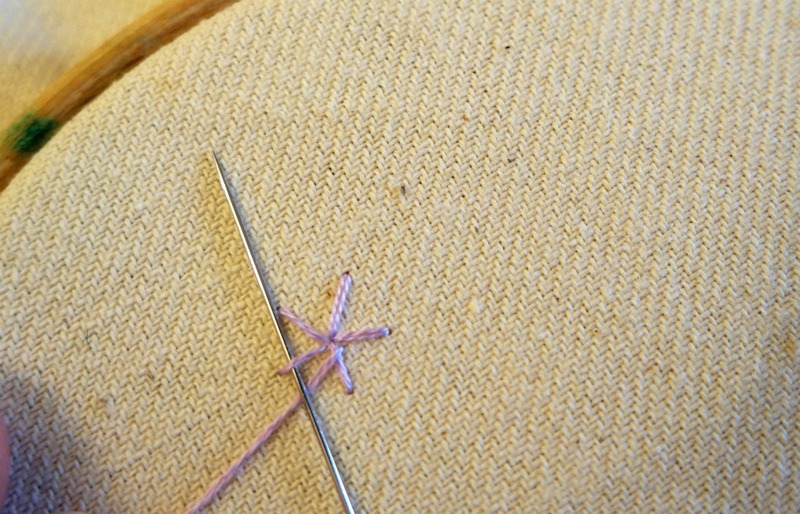 Bring the thread to the front again, between 2 of the stitches and near the centre. 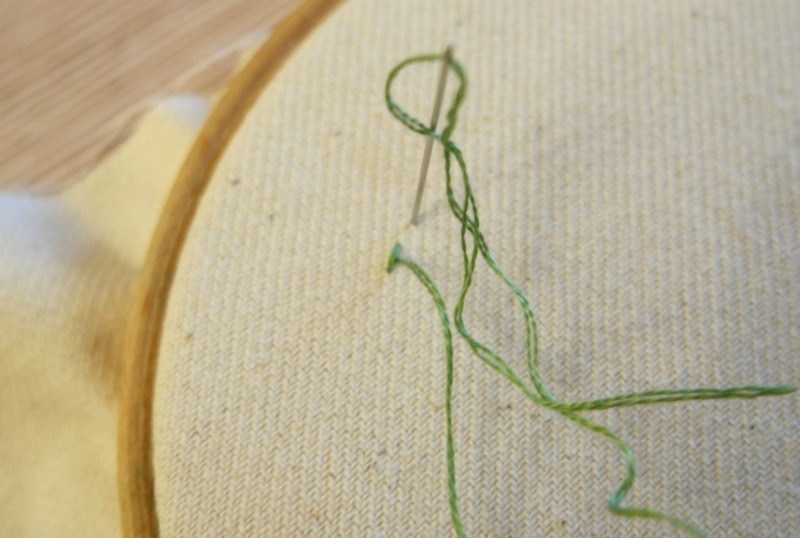 Take the needle over the first stitch, under the next, then over the next. Keep going like this until you have filled up the stitches. 5. Take the needle through to the wrong side and tie it off. 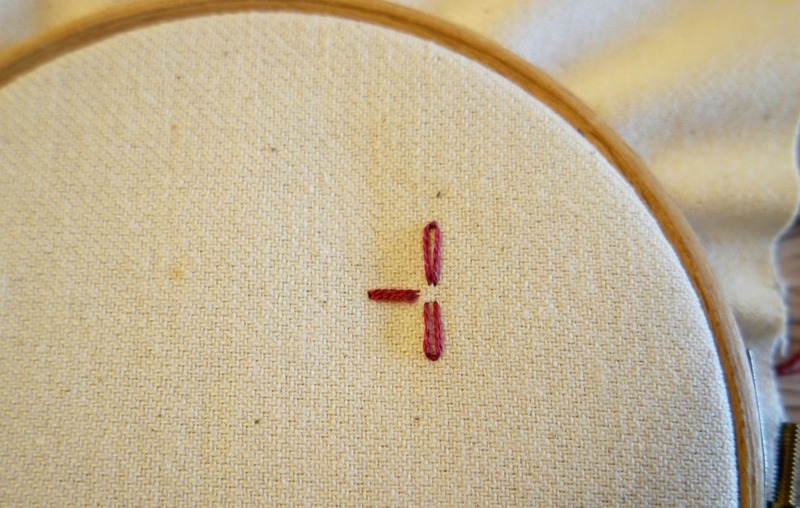 If you want to make a larger woven wheel stitch, you can increase the number of stitches in step 3. It will need to be an odd number though. 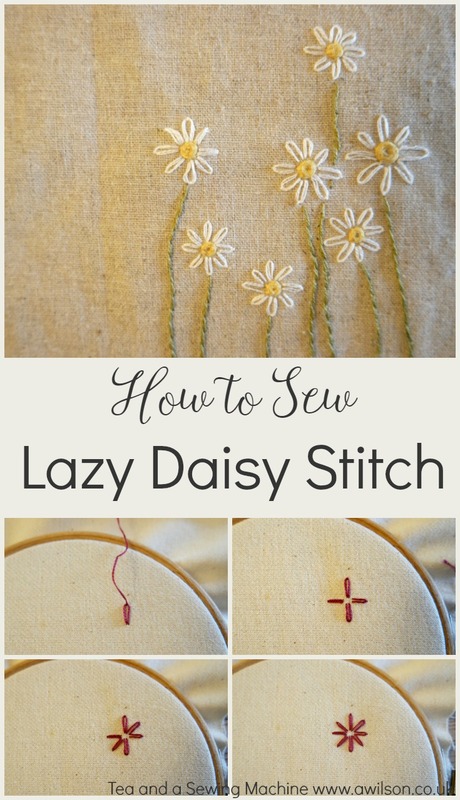 If you like this tutorial, you might also like this one showing how to sew lazy daisies. And if you would like 2 free embroidery designs to use however you like, you can download them here. If you’re wondering how to transfer designs to fabric, I have a post about doing that using your printer here. 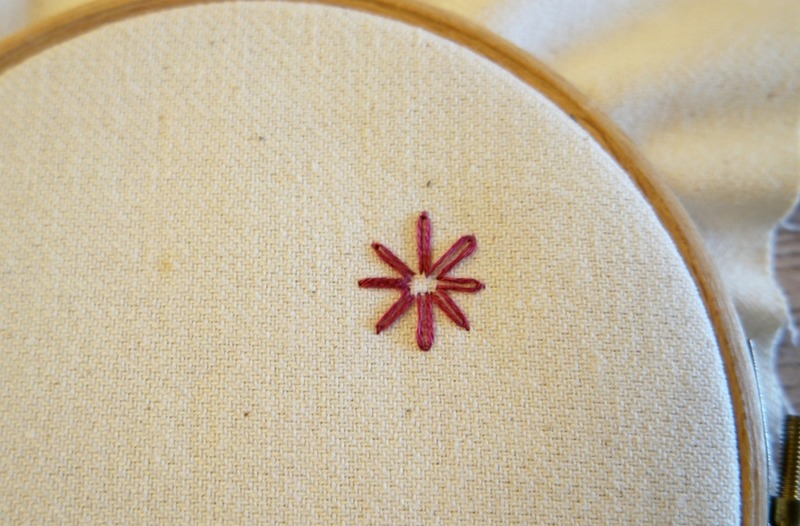 As the name suggests, lazy daisy stitch is useful for when you want to embroider the petals of flowers. 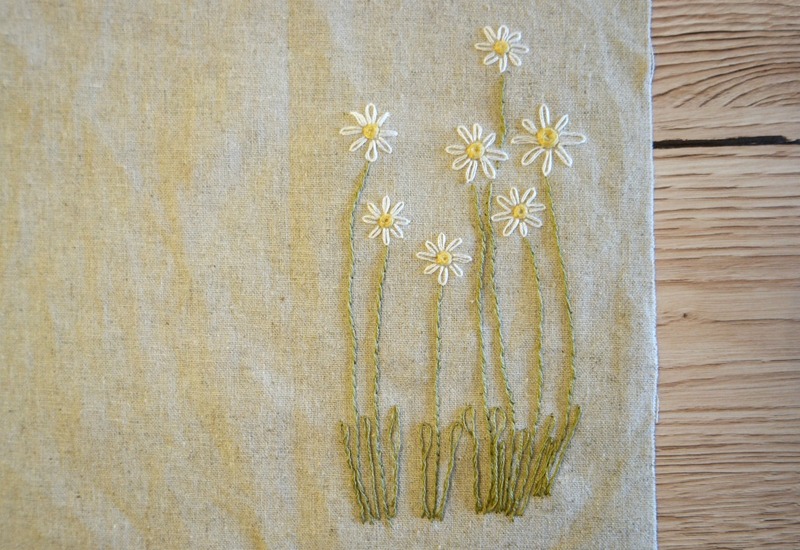 It’s a stitch you often see on vintage table cloths where flowers have been embroidered by hand. They can be grouped in 3s or 5s to give the idea of a closed flower, or embroidered around the centre of a flower, like a daisy. 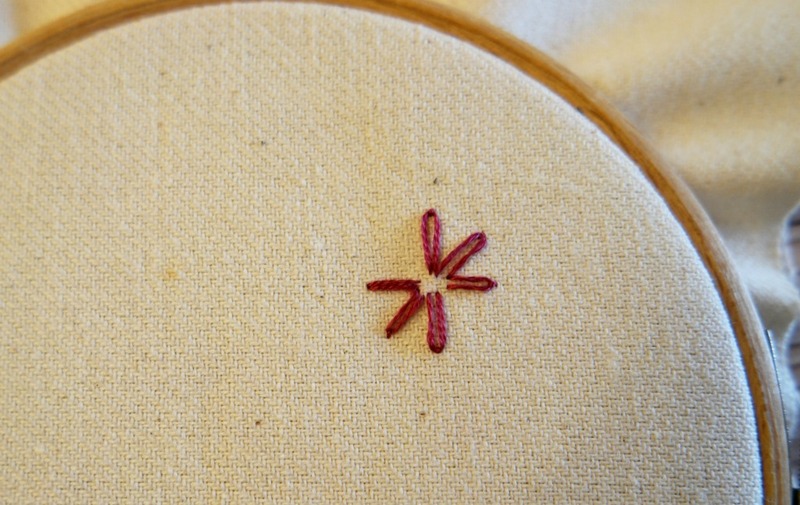 To embroider these flowers, I used a medium weight cotton linen blend and DMC embroidery thread. For the tutorial, I used a scrap of calico that I had left over from another project. 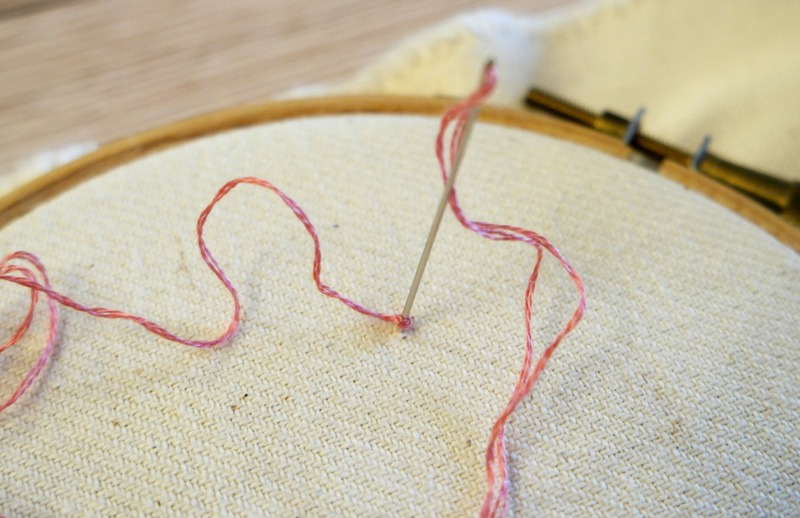 You can use pretty much anything, but if the fabric is very light you will need to use a lighter thread (or just one strand if you are using embroidery thread), and possibly fuse some interfacing to the back. 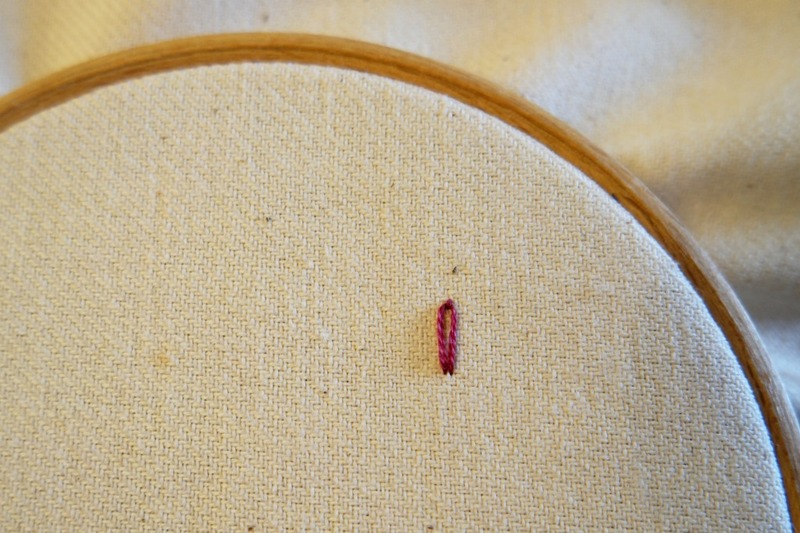 I also used an embroidery hoop, which makes everything stay nice and taut. It’s not essential but definitely a “nice to have”. If you like these daisies, keep reading to the end of the post! There’s a link to where you can get the design, plus another one that I’ll be showing you in a couple of weeks! 1. Find where you want to start the stitch. This will be the bottom of the petal, nearest to the centre of the flower. Bring the needle up to the right side of the fabric. 2. 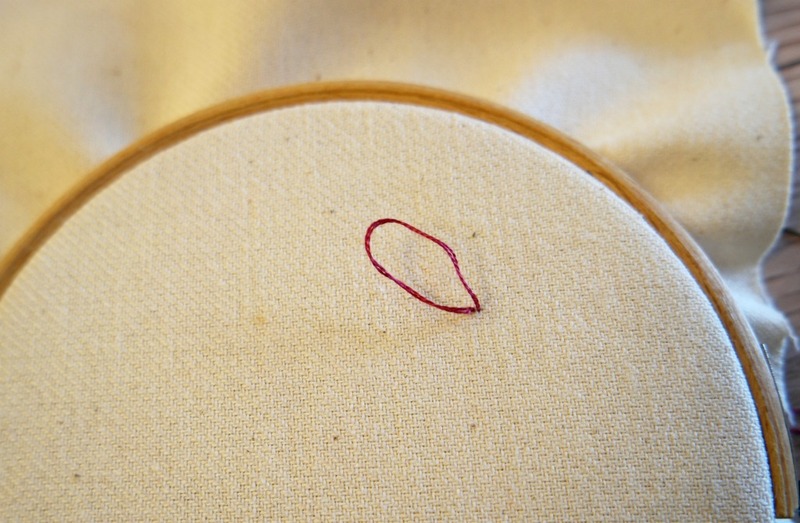 Make a loop and take the needle back through to the wrong side, next to where it came out. 3. 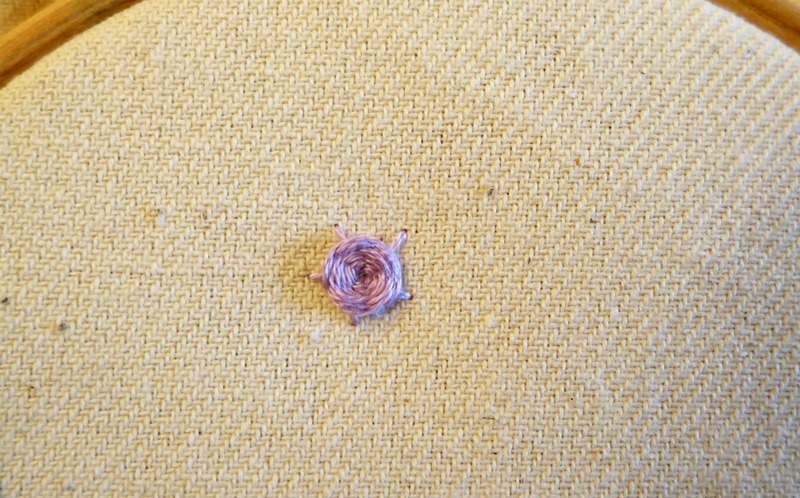 Bring the needle back up through the fabric where you want the other end of the petal to be. Catch the loop and pull it taut. 4. 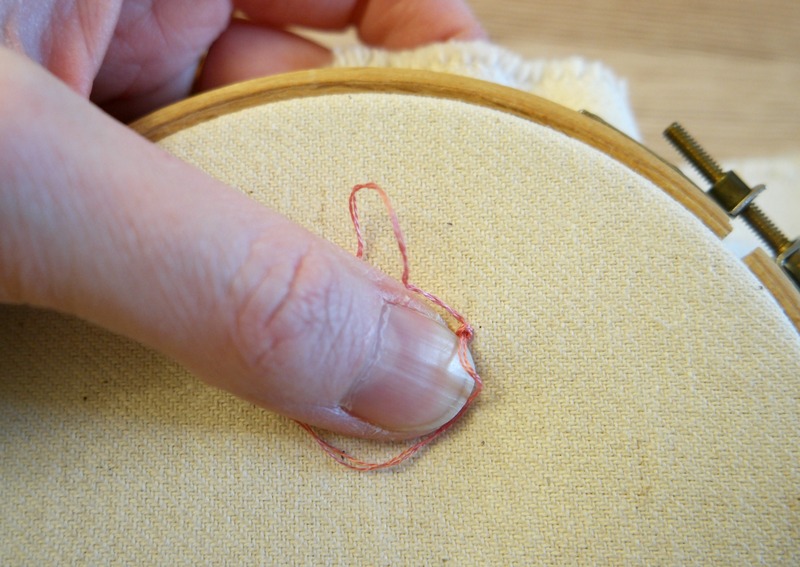 Take the needle back through to the wrong side, sewing over the end of the loop. You’ve now sewn one petal! 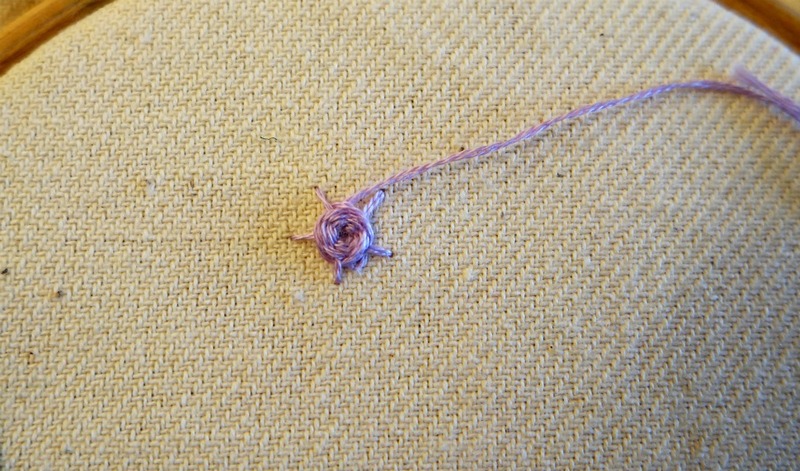 Keep going like this until you’ve finished your flower. If you don’t have a good eye for this kind of thing (I don’t! 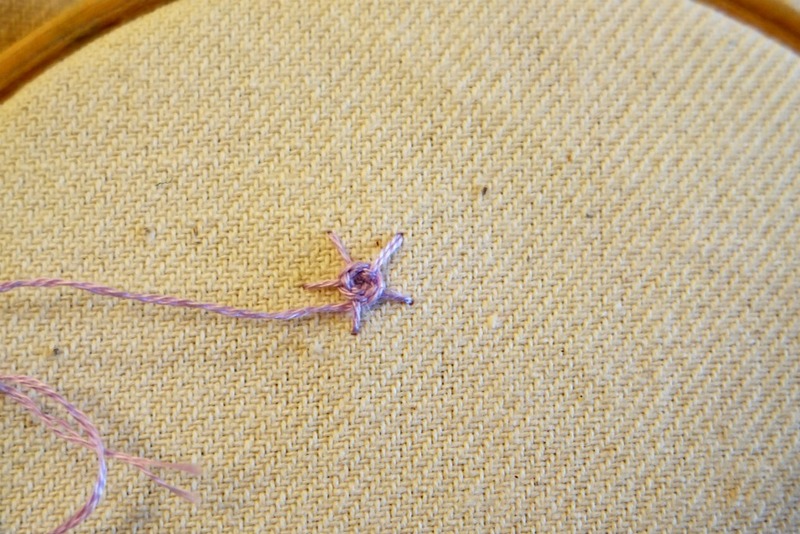 ), to avoid things turning out wonky you could sew the opposite petal, then the petal halfway between those 2, then the one opposite. So on the face of a clock, you would sew one at 12.00, then one at 6.00. Next you would sew one at 3.00, then one at 9.00. Keep going to until the flower is done! Alternatively you could mark your fabric with either a pencil or a fabric pen with disappearing ink. If you would like the flower design pictured above, plus another one, you can get it here.